‘Though poppies grow in Flanders fields’. 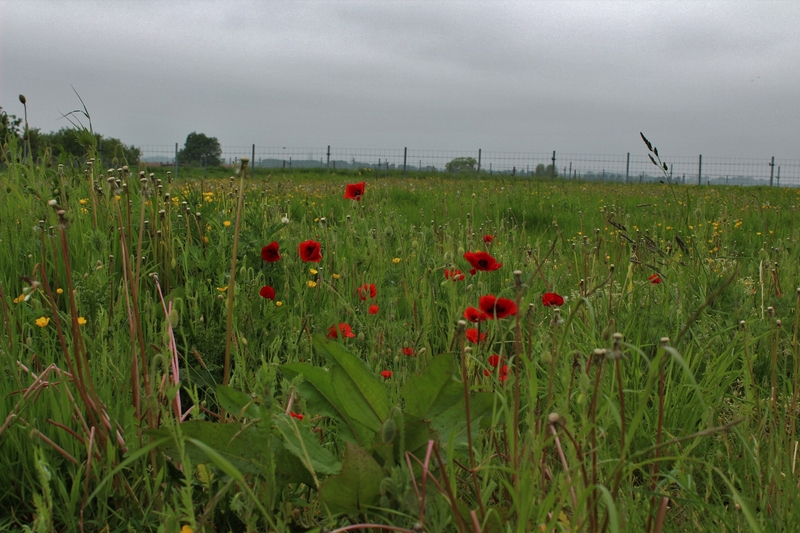 And the poppies are no myth, although this tranquil scene, looking west towards the spires of Ypres (Ieper) away on the horizon, would have been one of utter desolation for much of the Great War. A British trench named simply Trench No. 38 once ran across this field (at the base of Hill 60, behind us in this shot), roughly where we are standing, in effect looking over what would have been the trench parados towards the British rear area, and served as the front line, barring the trenches, shell holes and mine craters on the hill itself that were fought over by both sides throughout the first three years of the war. ‘At the time we sometimes wondered what it was all for, this attack on what was called a hill but which to us at the time was merely a system of muddy trenches, shell-torn ground, and a haunt of death. The place was practically a cemetery, and hundreds must have been buried on the ground, it proving impossible, when digging trenches, not to disturb some poor fellow in his last long sleep.’ Lieutenant C. W. G. Ince, Adjutant, 2nd Bn. Duke of Wellington’s Regiment. And so, before we go further, please keep in the back of your mind throughout our visit that Hill 60 is still a mass grave, the remains of hundreds, probably thousands, of soldiers lying somewhere beneath the ground here to this day, in an area that covers not much more than 600 square feet. The previous time we visited, the hill was covered in six inches of snow, and should you wish to see it in its winter plumage, there will be a link at the end of the post. No snow this time, but it’s a bit of a grey day as we arrive at the hill directly from our pick-up point back in England. 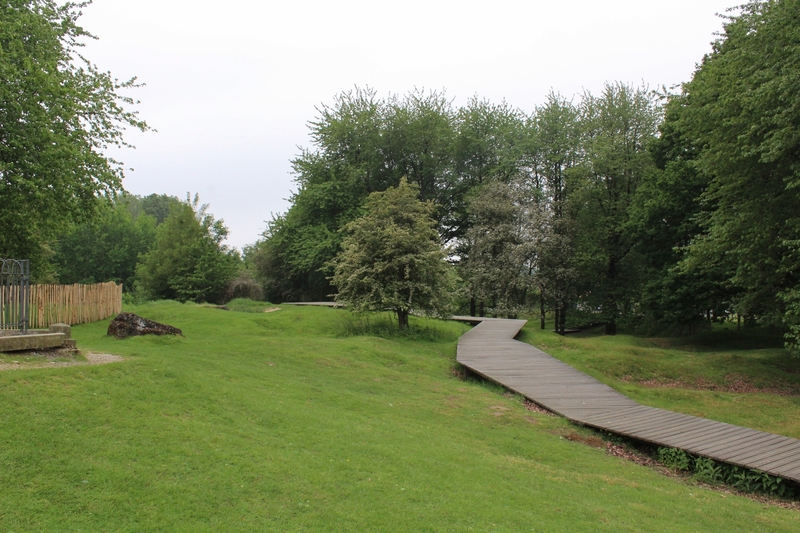 People have tramped across Hill 60 for a hundred years now, but these days you are expected to use the wooden walkway around the base of the hill, which is fair enough, I suppose. Although, now that you point it out, I appear to be ignoring it completely. That’s the Queen Victoria’s Rifles memorial up there, by the way. 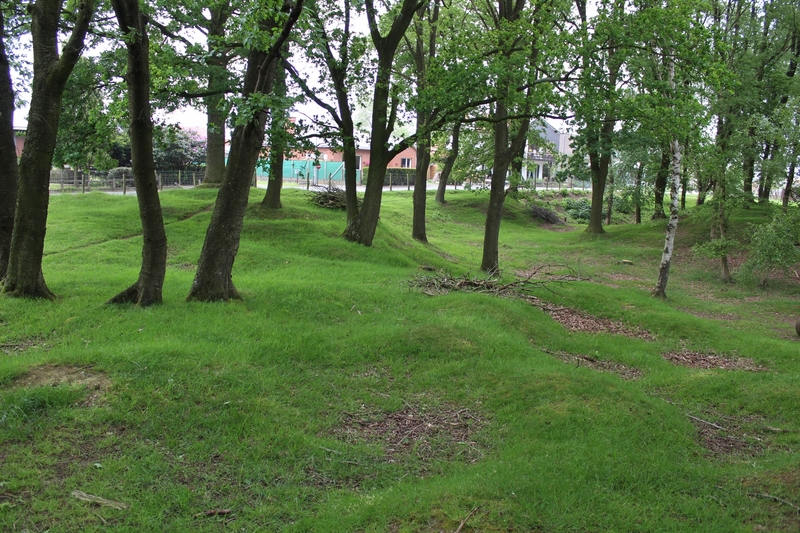 Initially held by the French, Hill 60, no natural feature, but a man-made hill created from the spoil from the adjacent railway cutting, was captured by the Germans on 10th December 1914, the British arriving to take over from the French at the end of January 1915. French plans to raid the hill were then upgraded to a British plan to recapture it*, and just after 7.00 p.m. on the evening of 17th April 1915, two pairs of mines, totalling some 9,400 lbs, were blown beneath the hill, with a single 500 lb mine exploded on the southern slope nearer to the railway line. 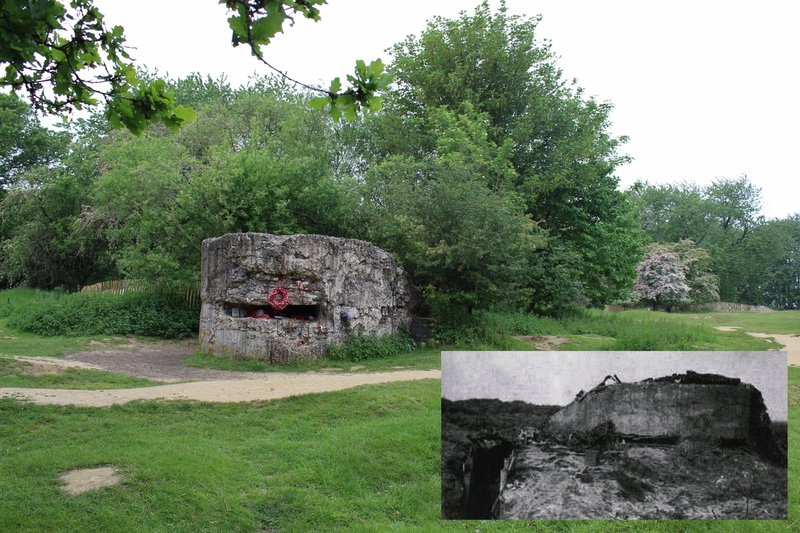 Men of the Royal West Kent Regiment, in the forefront of the attack along with the King’s Own Scottish Borderers, stormed the new craters and occupied the remains of the German defenses, for the next two days and nights fighting off consistent counterattacks before they were relieved. On 19th April the 1st Bn. 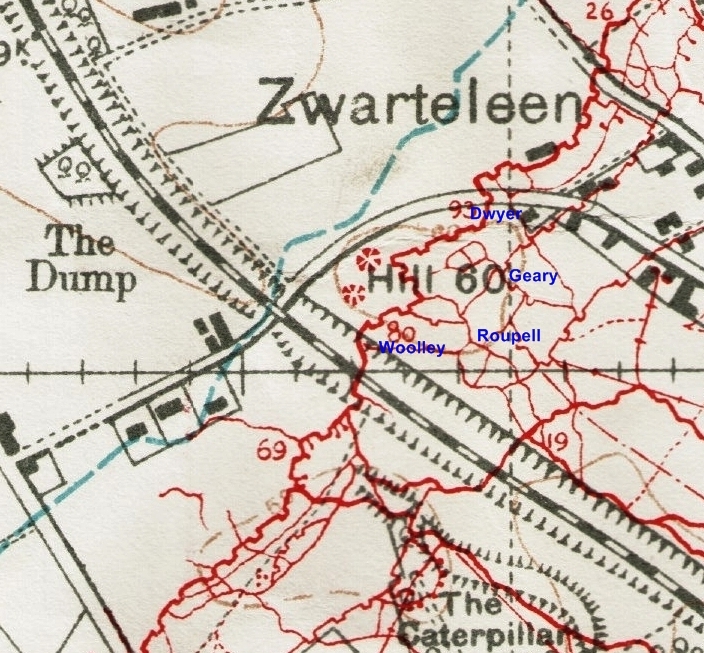 East Surrey Regiment took over the front line from the railway bridge to the little hamlet of Zwarteleen, including new, hastily dug, trenches leading up to the craters on the hill itself. 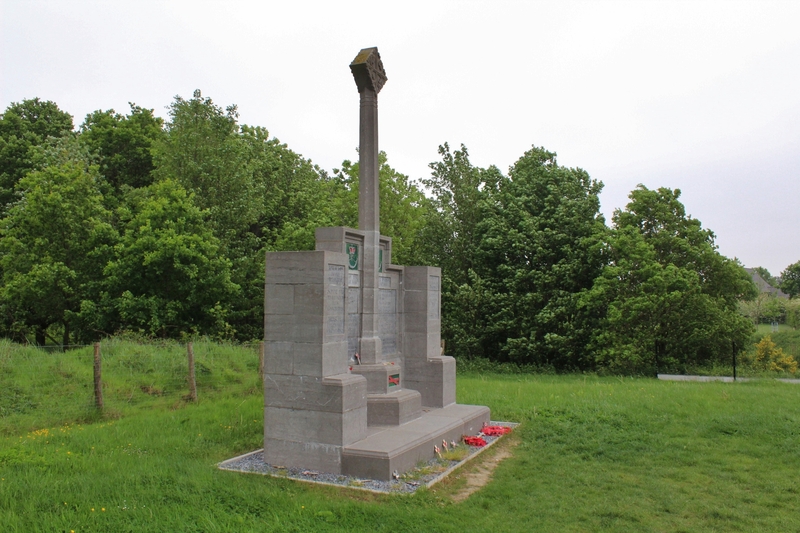 Between 19th & 21st April 1915 no less than four Victoria Crosses would be awarded to men fighting on Hill 60, three of which would go to men of the East Surrey Regiment. 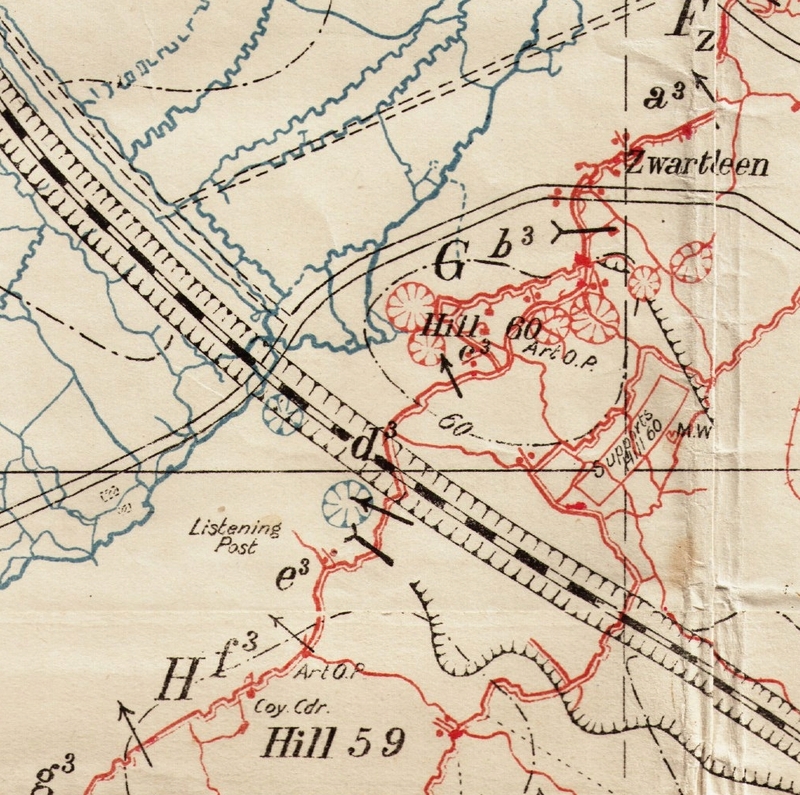 *Interestingly, the Official History casts doubt on this plan, maintaining that the capture of the hill would have created a dangerous salient in the British lines which could only have been avoided by the capture of the Caterpillar at the same time, a much larger and equally dangerous operation, particularly as it would involve simultaneous attacks on either side of the railway cutting; it is doubtful that British resources, particularly with regard to artillery support, were capable of such an operation at the time. 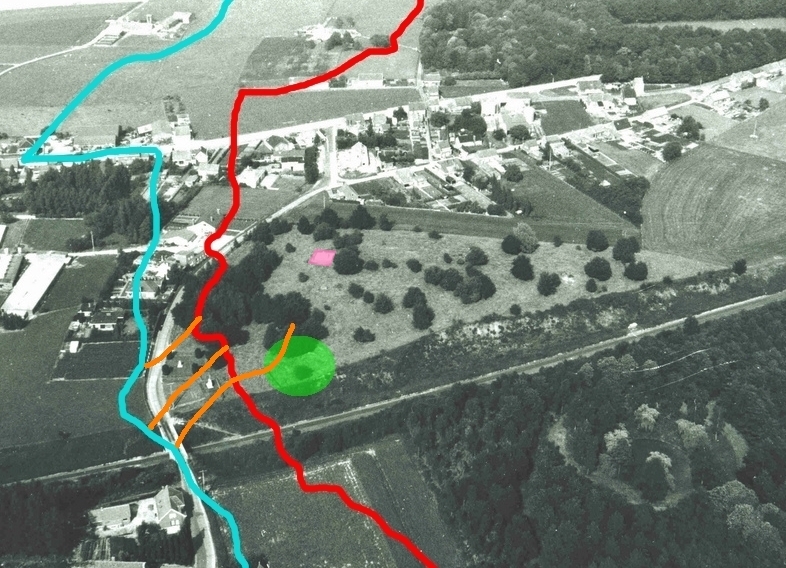 An aerial photograph of the hill, probably taken in the 1960s, on which I have annotated the approximate British front line in blue, and that of the Germans in red, as they were in 1915 & 1916, although every map shows minor changes to the course of the front lines (see trench maps coming up). 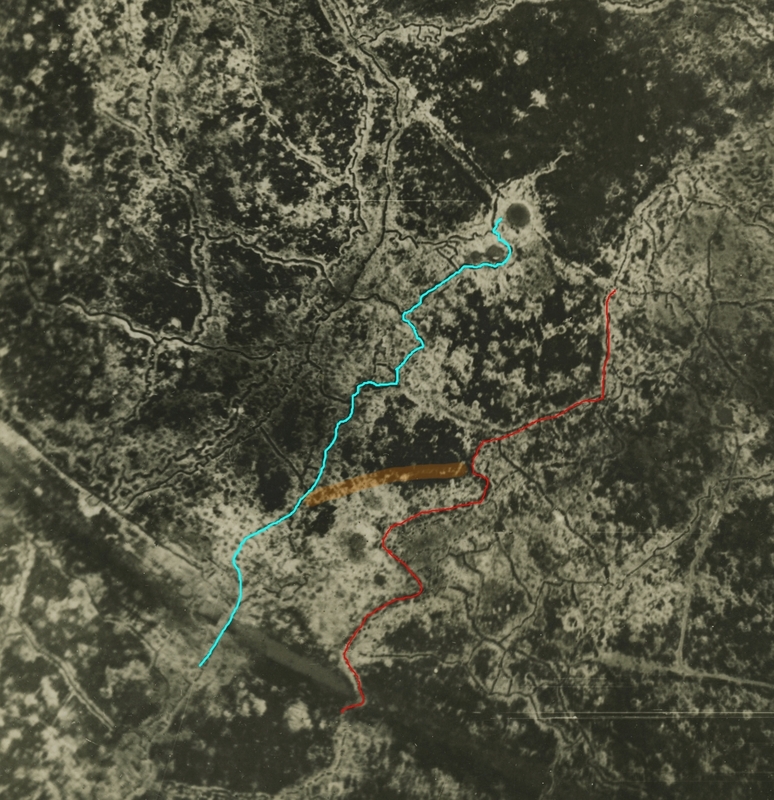 The three orange lines are the approximate position of the newly dug April 1915 trenches taken over by the Surreys leading up to the mine craters that I just mentioned. 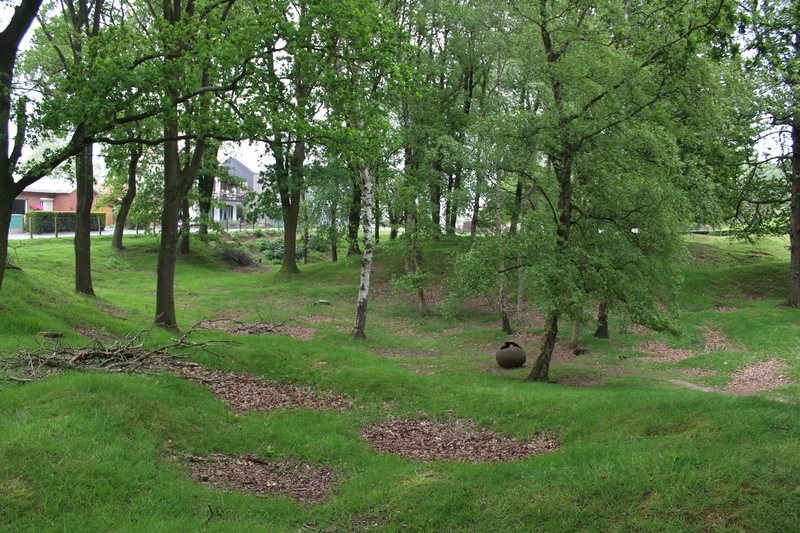 The 1917 mine crater, which obliterated the southern side of the hill, and which we shall only briefly visit on this occasion as we are concentrating on the 1915 fighting in this post, is marked in green, and the water-filled Caterpillar Crater, blown at the same time, can be seen amongst the trees south of the railway in the bottom right of the photo. The site of the Queen Victoria’s Rifles memorial is marked in pink. …whereas this one, dating from six months later, and originally made by the Germans, captured, and reproduced as a British map, shows much more detail. The British front line shows trenches leading up to the most western mine crater, small saps leading round a part of the crater’s rim, mere feet from where the German line meets the eastern side of the same crater. We shall see evidence of the closeness of the front lines again later. 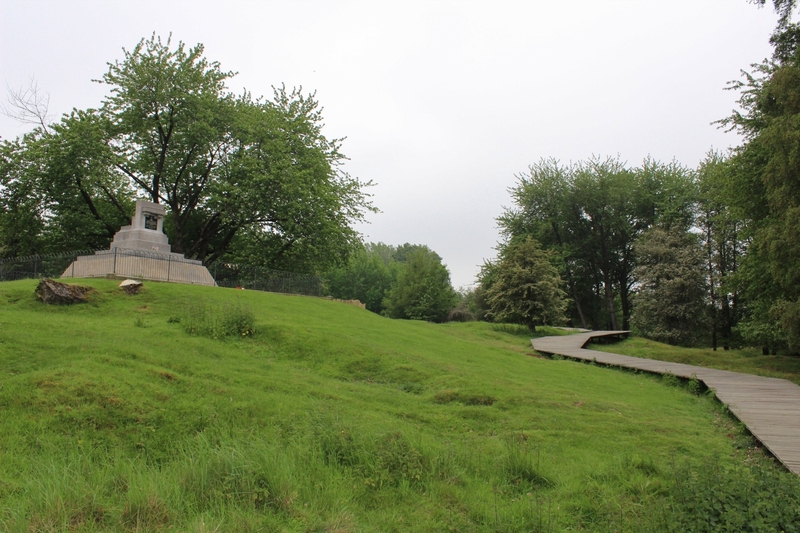 …the only official memorial on Hill 60 itself. It remembers all the riflemen who died in two World Wars, and the plaque is actually very interesting, and explains why the memorial is no longer as you see it in the inset inter-war views. 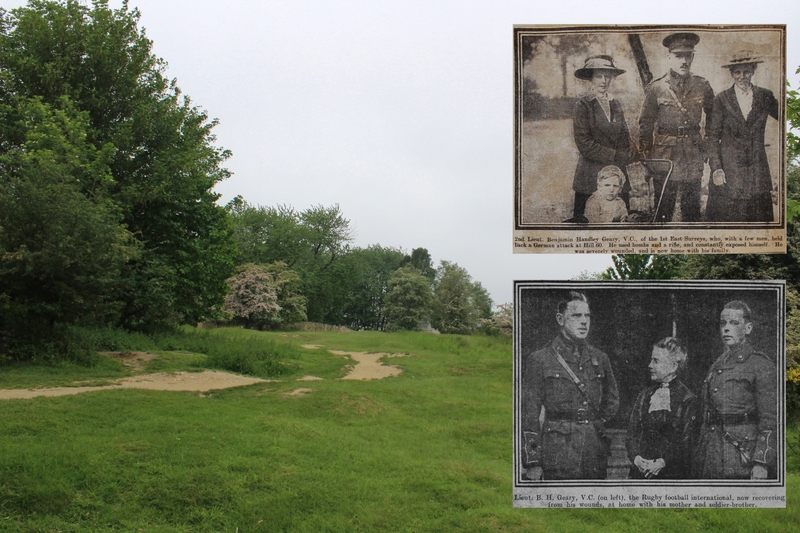 If you wish to know more, I refer you once again to the previous Hill 60 visit, where the equivalent photograph will enlarge enough to enable you to read it. 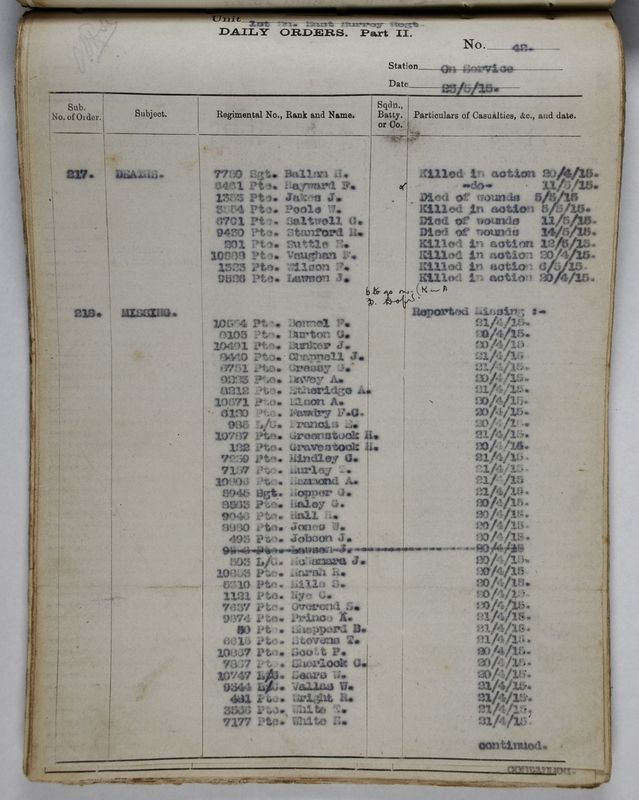 Private Edward Dwyer, 1st Bn. East Surrey Regiment, was just nineteen years old when, finding himself alone in a trench, apart from dead and wounded men, and his position about to be overrun by advancing Germans using shell holes as cover, he gathered together all the bombs in the vicinity, in his words ‘about 300 in all’, and, climbing on to the parapet, in full view of the enemy, proceeded to hurl bombs by the dozen into the nearby shell holes and at any Germans he could see. 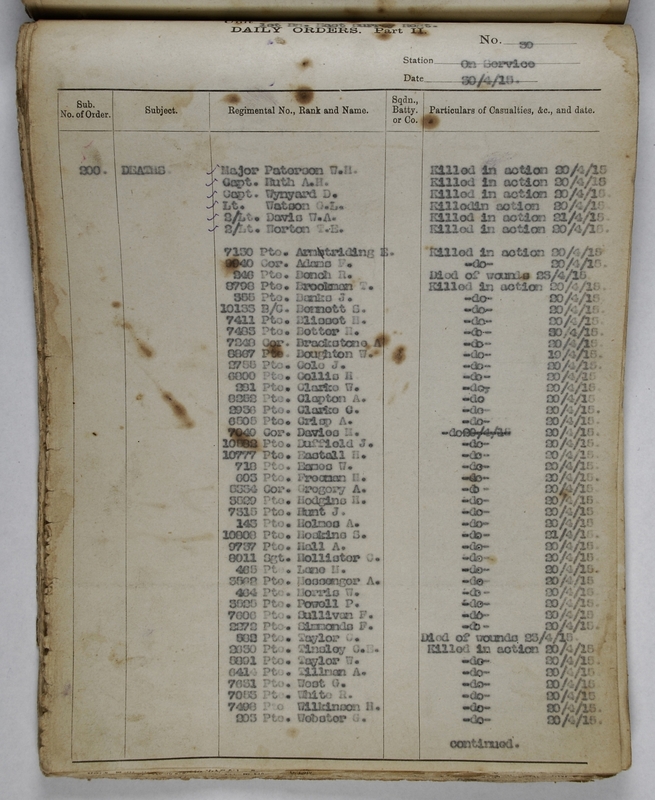 The Germans hurled bombs back, but remarkably Dwyer was not hit, and held them at bay singlehandedly until reinforcements arrived, and the Germans were halted. 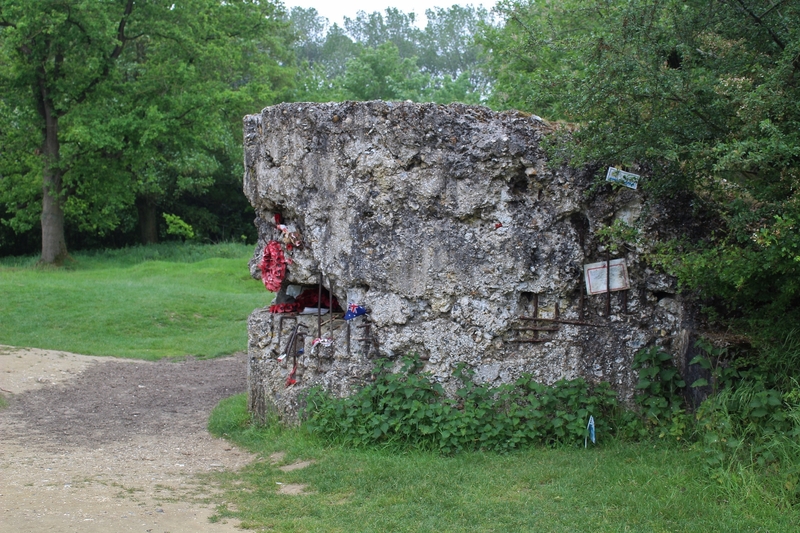 The London Gazette published the following citation on 21st May 1915, “For most conspicuous bravery and devotion to duty at ‘Hill 60’ on the 20th April, 1915. When his trench was heavily attacked by German grenade throwers he climbed on to the parapet, and, although subjected to a hail of bombs at close quarters, succeeded in dispersing the enemy by the effective use of his hand grenades. 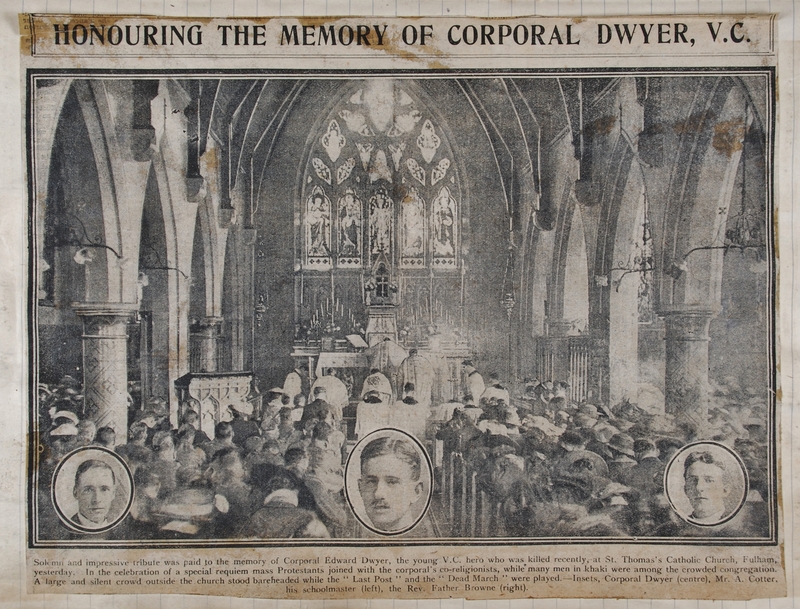 Private Dwyer displayed great gallantry earlier on this day in leaving his trench, under heavy shell fire, to bandage his wounded comrades”. 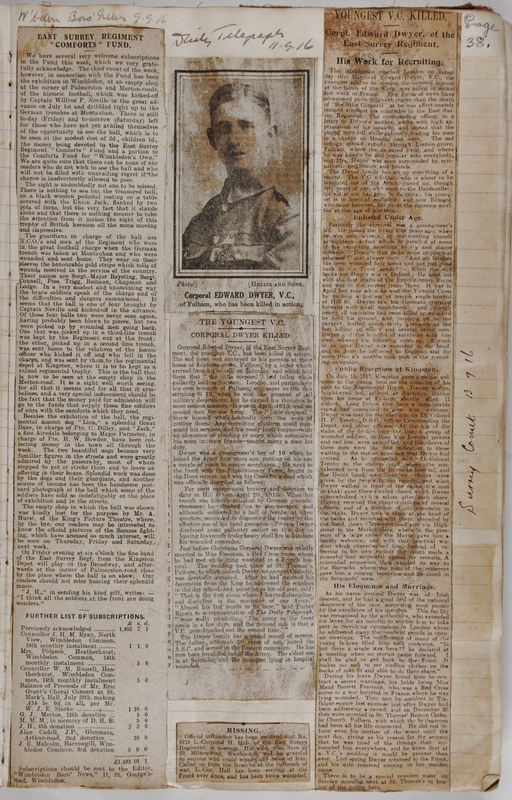 The newspapers were full of the exploits of this youngest of the Great War Victoria Cross winners, as these two reports (click to enlarge for reading purposes) show, and we shall return to Edward Dwyer later. 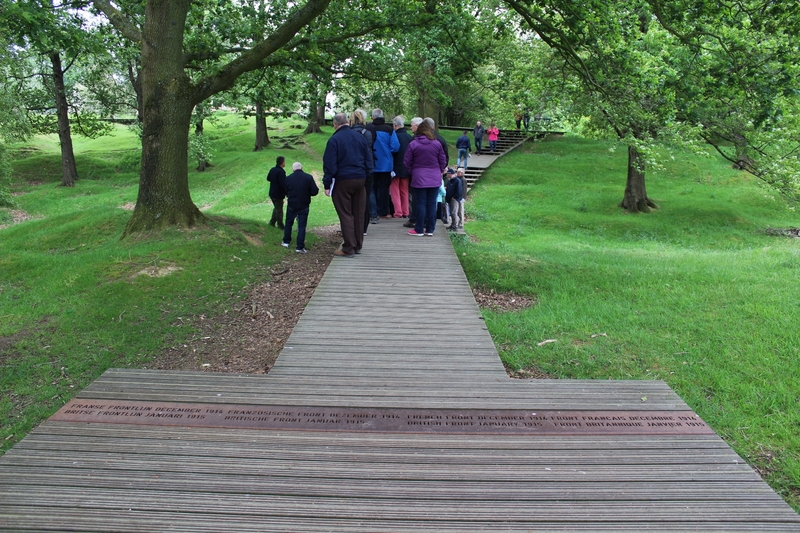 Whilst visiting Hill 60 it is important to be aware that what you see today is the hill following three years of seldom less than unpleasant fighting and a hundred years, barring a few, of peace. In the final year of the war the hill changed hands twice, but on neither occasion did it prove the terrible obstacle that it had been in previous years, the British abandoning the hill on 15th April 1918 in a planned withdrawal in the face of the German offensive, and sweeping across it themselves on 28th September, by which time the hill rated not a single word in the Official History. The hill’s heyday, if that is the correct terminology, was between the early days of trench fighting and the opening of the Third Battle of Ypres, and it should be remembered that the huge mine crater blown on the hill on the morning of 7th June 1917 not only saw the end of the serious fighting on the hill, but removed a large amount of terrain that had been fought over continuously in previous years; thus the land where one of our Victoria Cross recipients fought no longer exists as it did when he was there, and the earlier 1915 mine craters, so crucial to the fighting during Second Ypres, have been mutilated by the explosions of thousands of shells over the two years following their detonations. 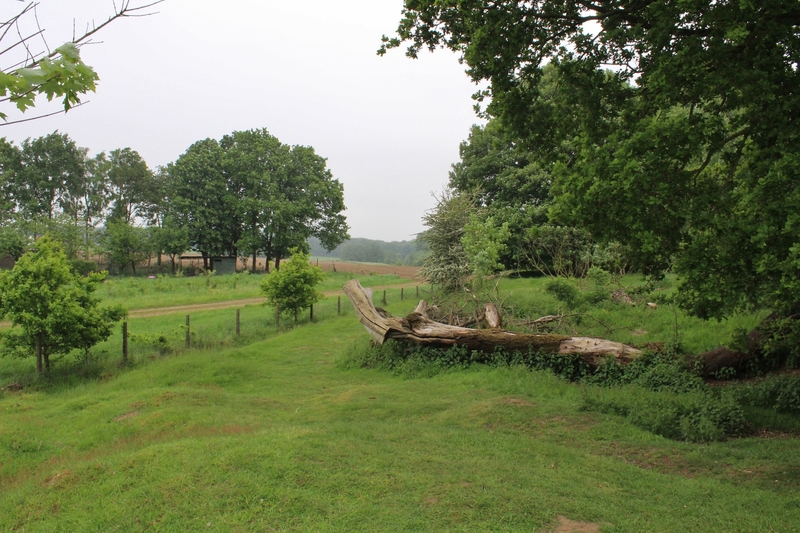 …from where we look north east towards the scene of Edward Dwyer’s exploits in the distance, the British front lines where the houses now stand. Craters everywhere; in late December 1914, and again in late January 1915, the French had become the first to tunnel beneath the hill, detonating two small mines somewhere in the vicinity of the above photo, and it may be that some of these depressions are a legacy of those early days of mining. 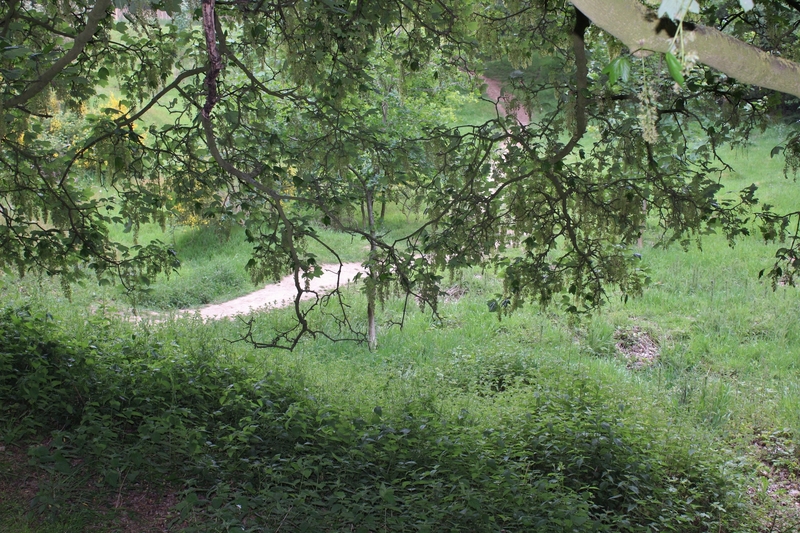 The view looks due east towards the Queen Victoria’s Rifles memorial through the trees in the distance. 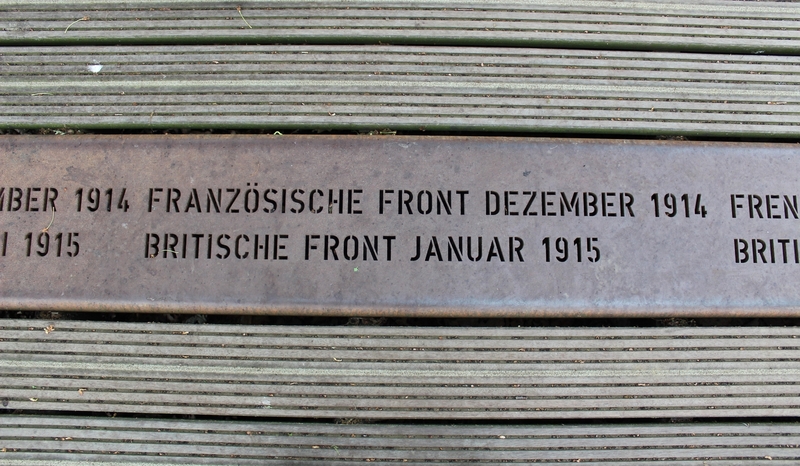 …the front line at the time of the handover from the French to the British in January 1915 is marked. 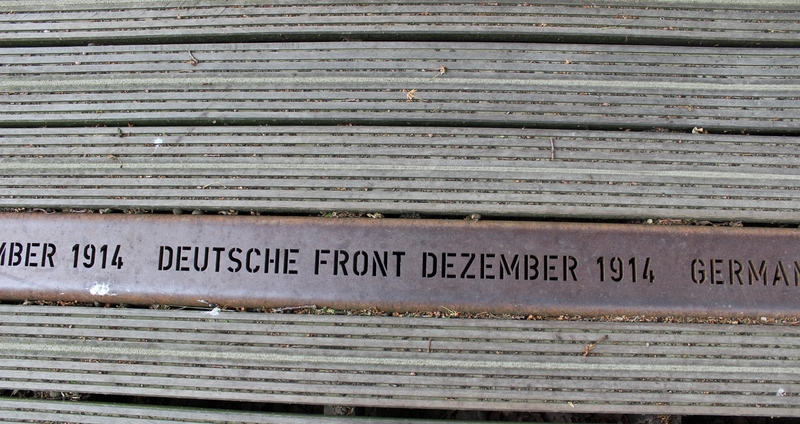 …the German front line at the same time. I repeat; maybe fifty feet apart. Up on the hill proper, I took you down into the crater made by the 1917 mine last visit, and it is once again there that you will find photographs taken from the crater floor. Suffice to say that it was the furthest north of the nineteen mines detonated at the start of the battle of Messines on 7th June 1917. And the only one that is dry. At this point I am going to insert this photograph of an information board that can actually be found at the base of the hill, because it includes a very interesting aerial photograph which shows the craters on either side of the railway cutting that were left after the explosion of the two most northern of the nineteen mines detonated on the morning of 7th June 1917, the Hill 60 crater on the right, and half the crater on the Caterpillar on the left. 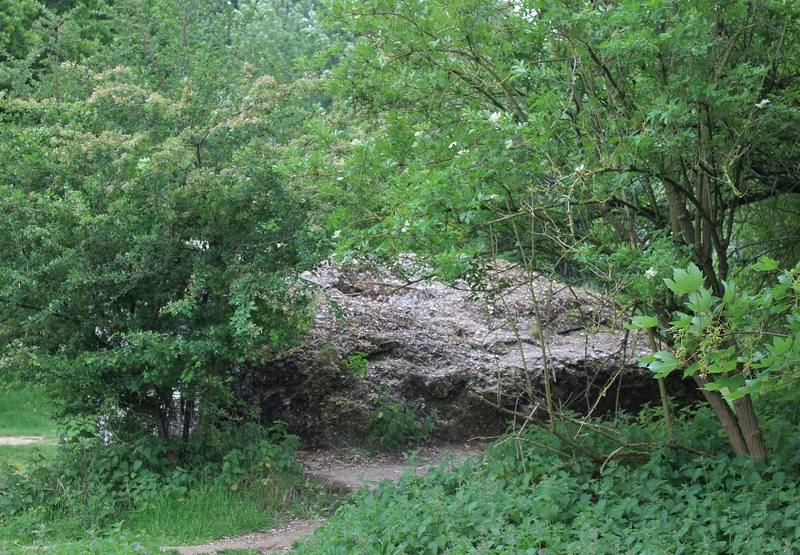 What is clear is that the Hill 60 mine actually collapsed part of the railway embankment, and yet today the edge of the crater is a good fifty foot from the edge of the embankment. 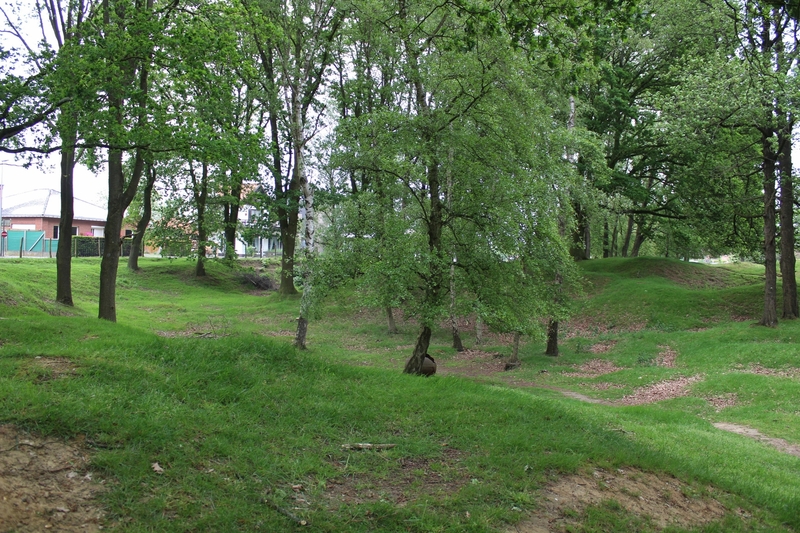 I’ve always wondered about the size of the Hill 60 crater, and it seems that, post-war, part of it must have been filled in when the embankment was rebuilt, and thus it is not entirely true when you read that Hill 60 has been left untouched since the war. 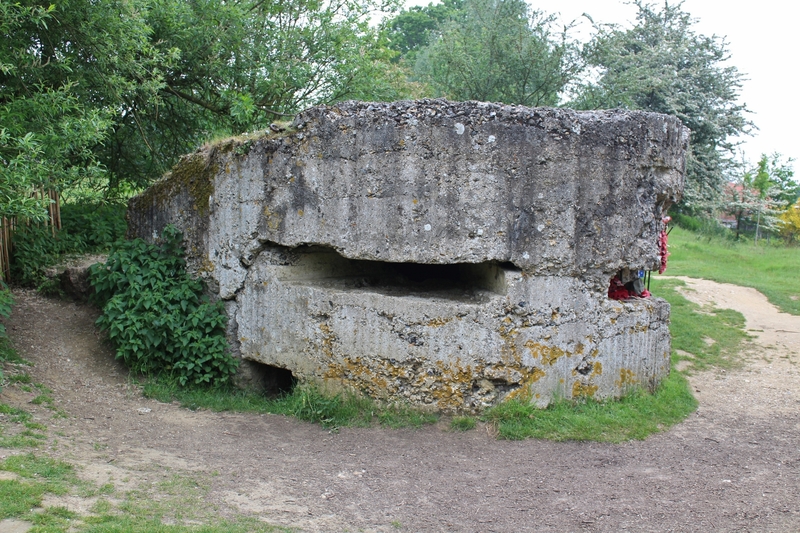 Anyway, I want to take a look at the famous bunker, perhaps the most photographed of all the bunkers that still remain in Flanders, before we are herded back onto the coach, and it’s also about as close as we are going to get to where our second V.C. 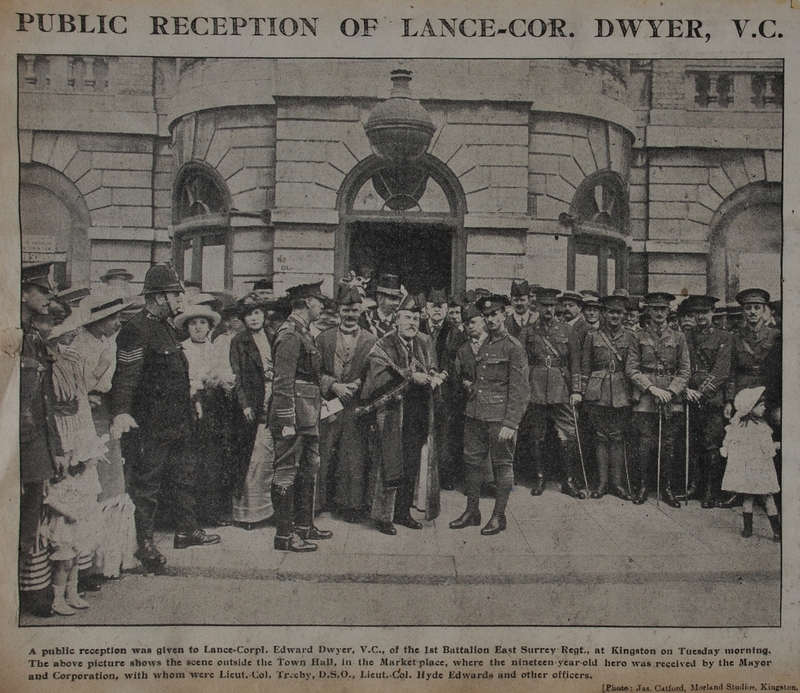 winner found himself during the afternoon of 20th April 1915. 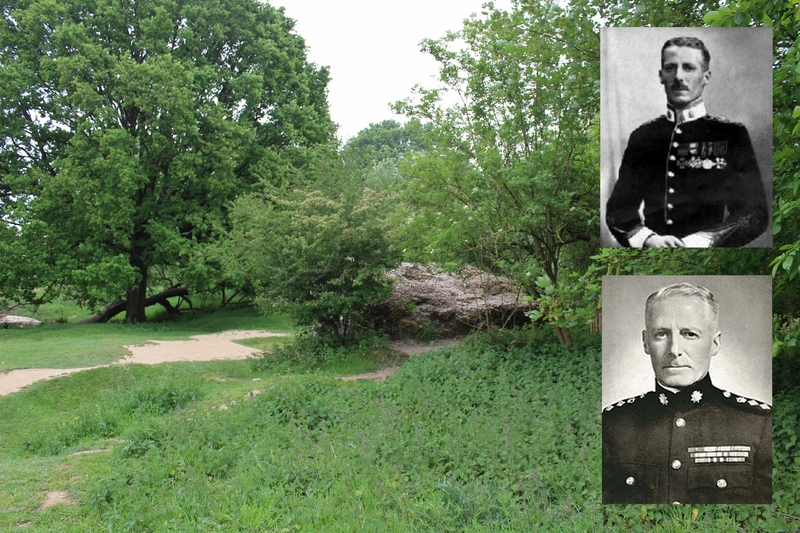 Lieutenant George Rowland Patrick Roupell (top photo with his V.C., bottom photo as a Brigadier General) was in the most advanced trench, beyond the new craters and facing the German communication trenches which, although quickly blocked, could not prevent continuous German assaults on his position. His citation reads, “For most conspicuous gallantry and devotion to duty, on the 20th April 1915, when he was commanding a company of his battalion in a front trench on Hill 60, which was subjected to a most severe bombardment throughout the day, though wounded in several places, he remained at his post and led his company in repelling a strong German assault. During a lull in the bombardment he had his wounds hurriedly dressed, and then insisted on returning to his trench, which was again being subjected to a severe bombardment. Towards evening, his company being dangerously weakened, he went back to his battalion headquarters, represented the situation to his commanding officer, and brought up reinforcements, passing backwards and forwards over ground swept by heavy fire. With these reinforcements he held his position throughout the night, and until his battalion was relieved next morning. The young officer was one of the few survivors of his company, and showed a magnificent example of courage, devotion and tenacity, which undoubtedly inspired his men to hold out till the end”. George Roupell received no less than eight wounds during the action. …as the plan (inset above) shows. The converted bunker was not, as the casual observer might think, a machine gun post but an observation post, and an important one at that. 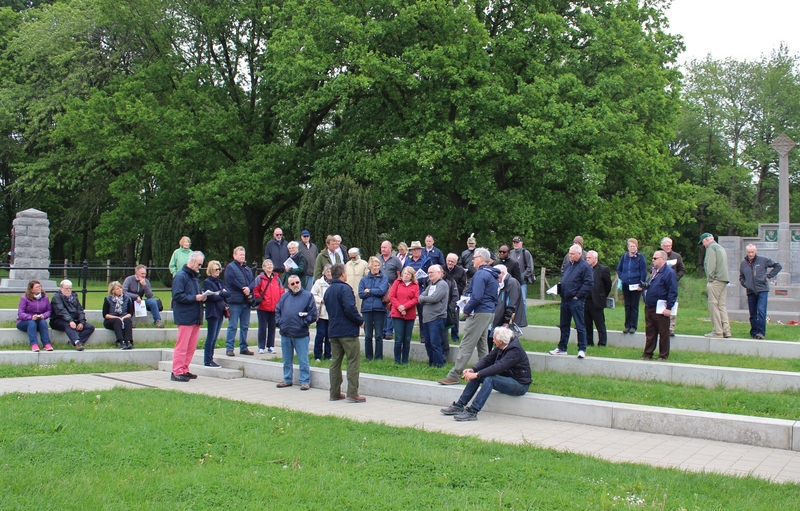 Defended by nearby machine gun positions on the hill, and giving excellent views of the German lines to the east (below – remember, no trees then) and south, the 2nd Australian Field Artillery Brigade used the bunker to spot enemy artillery flashes and direct artillery fire on to German artillery positions to the rear. 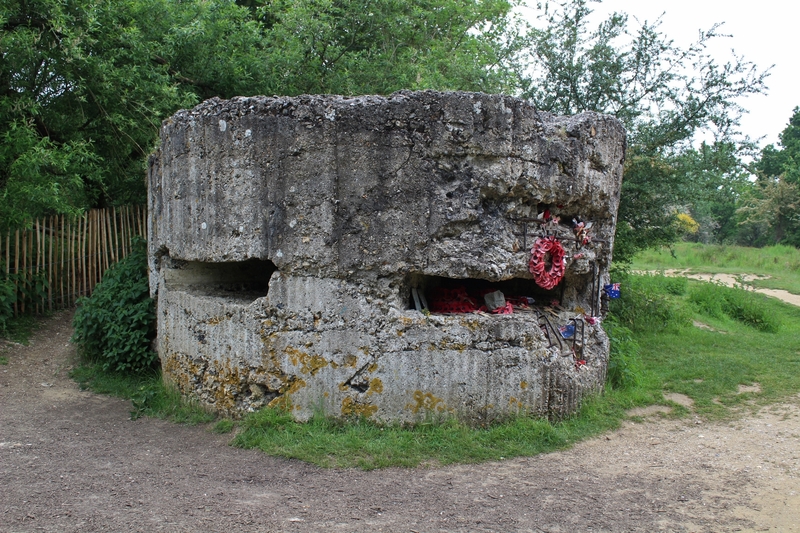 You can still see part of the original German bunker at ground level on the right of this shot as well as evidence of a direct hit (possibly two direct hits) on the aperture, leaving the marks of its massive impact and exposing some of the steel rods within the concrete (below). 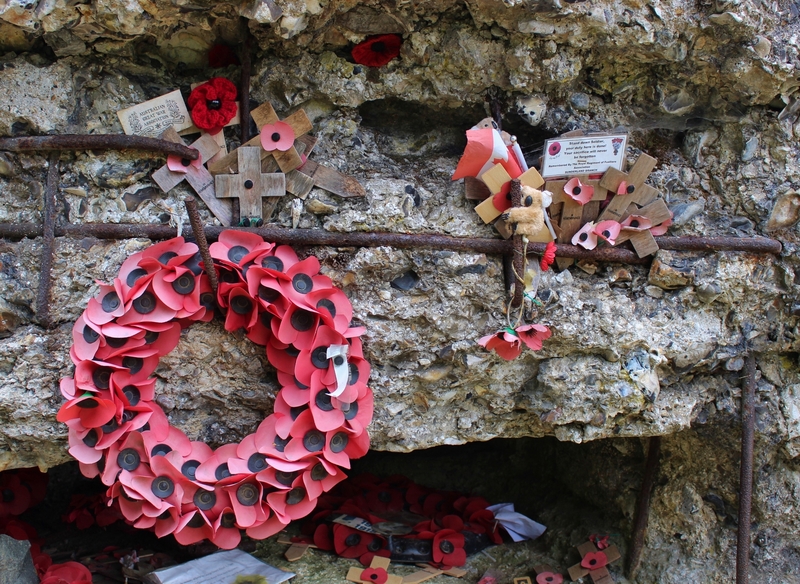 …but now the bunker is festooned with wreaths, poppies and crosses. 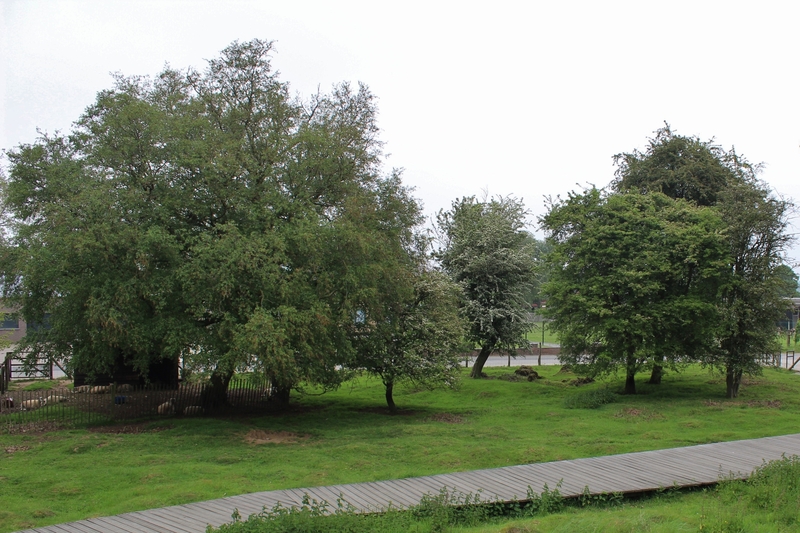 A second aperture on the left faces south, and would once have had superb views, now obscured by trees, of the Caterpillar to the south of the railway line. 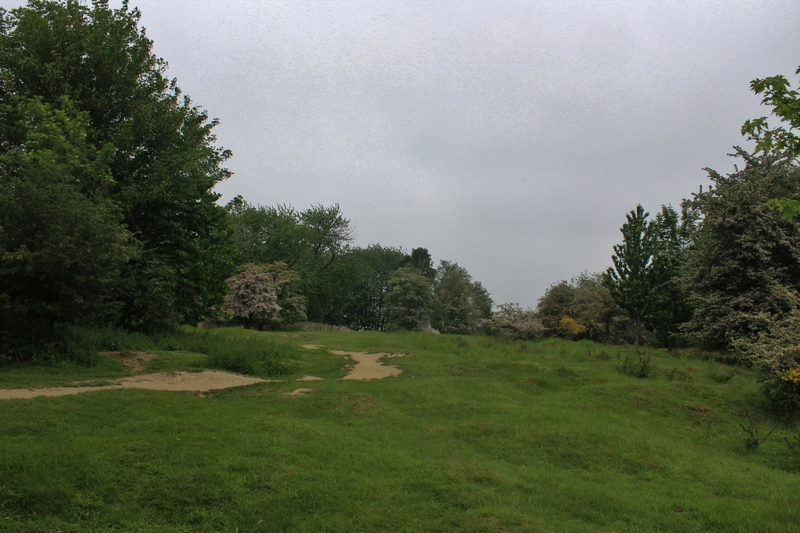 …the trench leading to it visible in the (purported*) post-war inset photograph, which also shows how the spoil excavated when the bunker was built was used to raise the ground surface around it; the ground level is now some feet lower than when the bunker was in use. 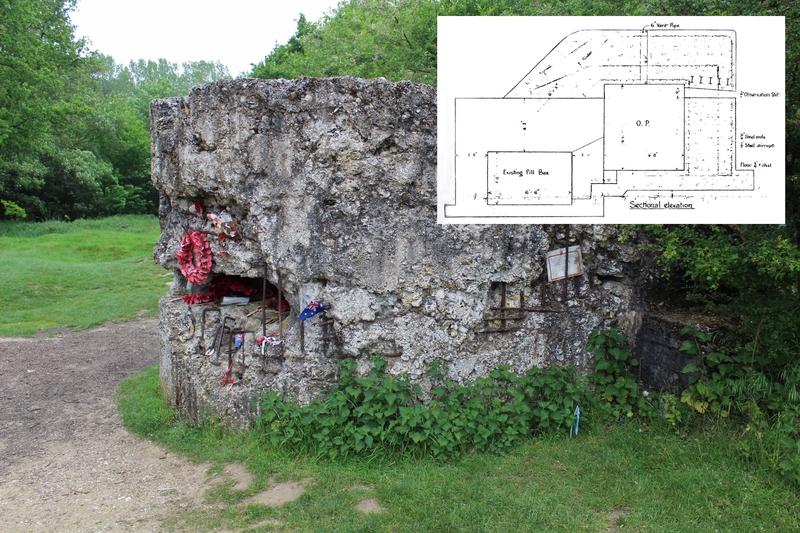 *purported, because there appears to be little damage to the bunker in the inset, and no sign of the shell damage to the aperture on the right that is so clear in the main photograph, so if it is the same one, which it professes and appears to be, then the photograph must be from some time earlier in 1918, soon after its conversion. 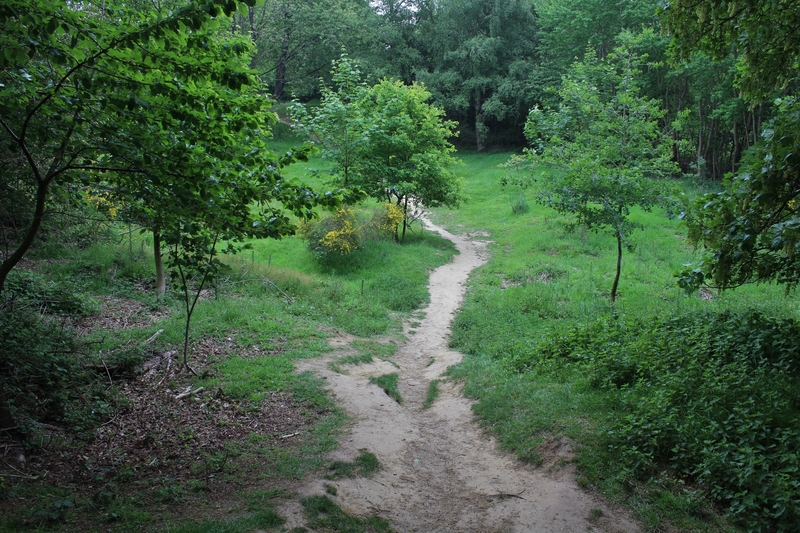 …we will find ourselves roughly where the third of the V.C. winners (convalescing at home in the insets below) earned his award. 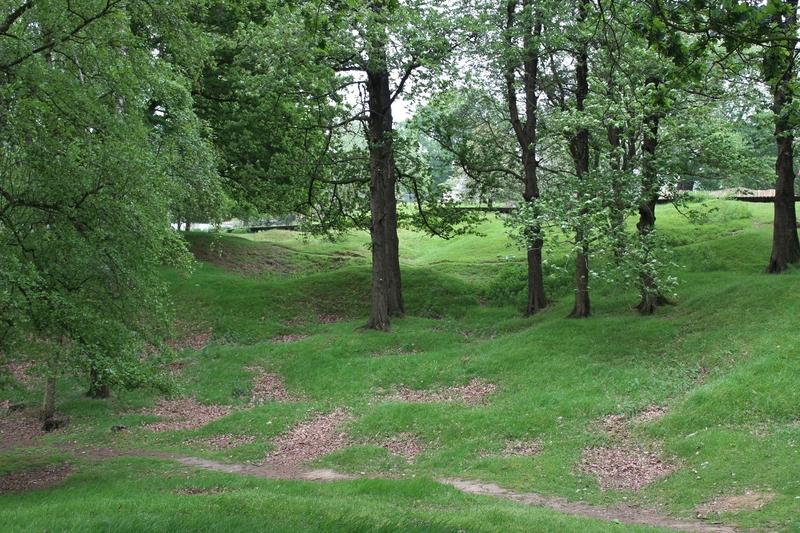 Second Lieutenant Benjamin Handley Geary’s citation reads, “For most conspicuous bravery and determination on Hill Sixty near Ypres on 20th and 21st April 1915, when he held the left crater with his platoon, some men of The Bedfordshire Regiment and a few reinforcements who came up during the evening and the night. 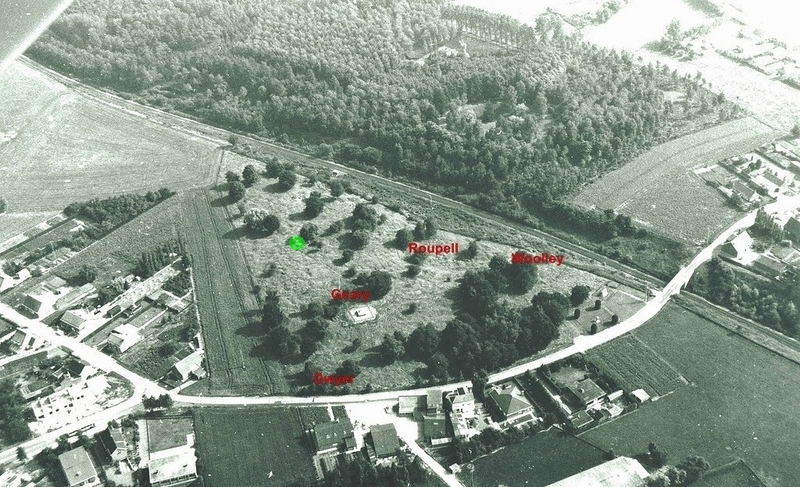 The crater was first exposed to a very heavy artillery fire, which broke down the defences and afterwards, throughout the night, to repeated bomb attacks which filled it with dead and wounded. Each attack, however, was repulsed, mainly owing to the splendid personal gallantry and example of Second Lieutenant Geary. At one time he used a rifle with great effect, at another threw hand grenades and exposed himself with entire disregard to danger, in order to see, by the light of flares, where the enemy were coming on. In the intervals between the attacks, he spent his whole time arranging for the ammunition supply and for reinforcements. He was severely wounded just before daybreak on 21st April”. Geary had been shot in the head and was evacuated back to Blighty. He would not only lose the sight in his left eye, but would also subsequently suffer from impaired vision in his right. …and the fourth of our V.C. 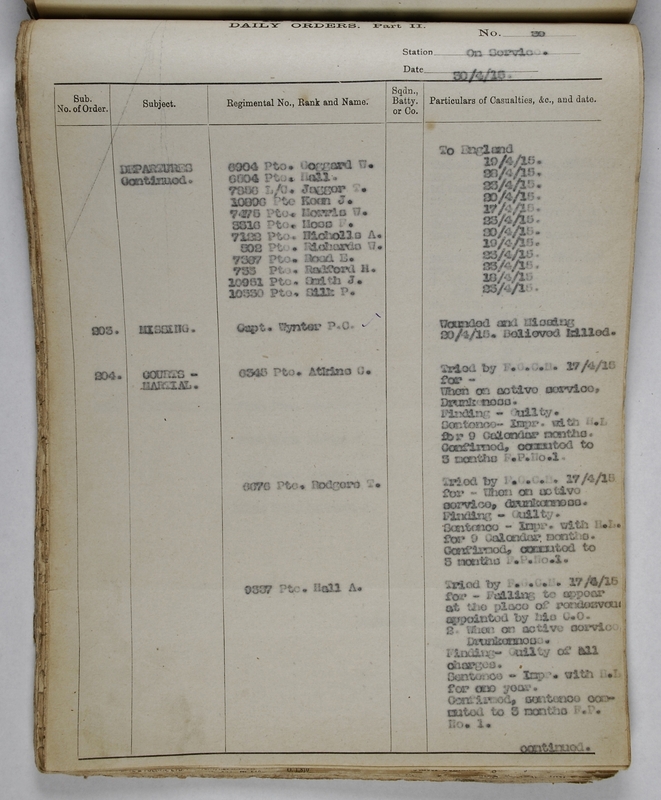 recipients, and the only non-East Surrey man, Lieutenant Geoffrey Harold Woolley, 1/9th Bn. (Queen Victoria’s Rifles) London Regiment, would certainly have been familiar with it too. 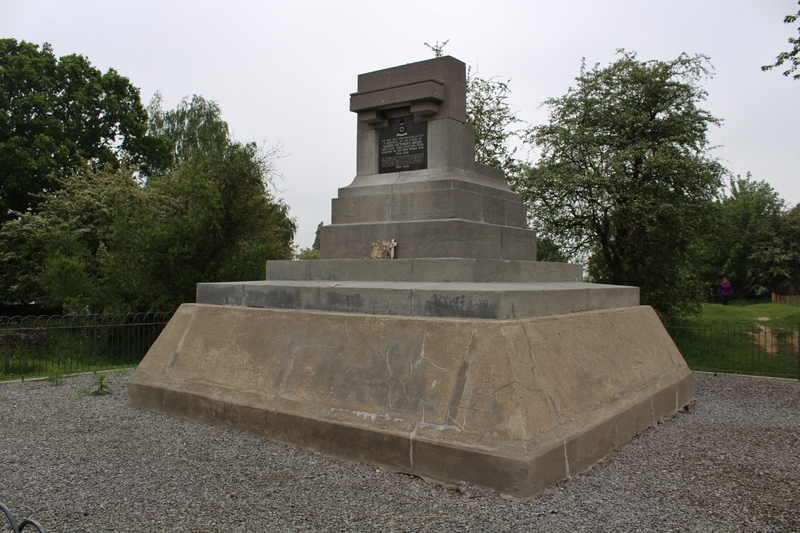 On the afternoon of 20th April 1915 Woolley’s company were engaged in supplying ammunition to the troops on the hill. With the situation seriously deteriorating, and with no other officers on the hill still alive, Woolley refused both verbal and written orders to retire, maintaining that he and his men would remain defending the hill until properly relieved. 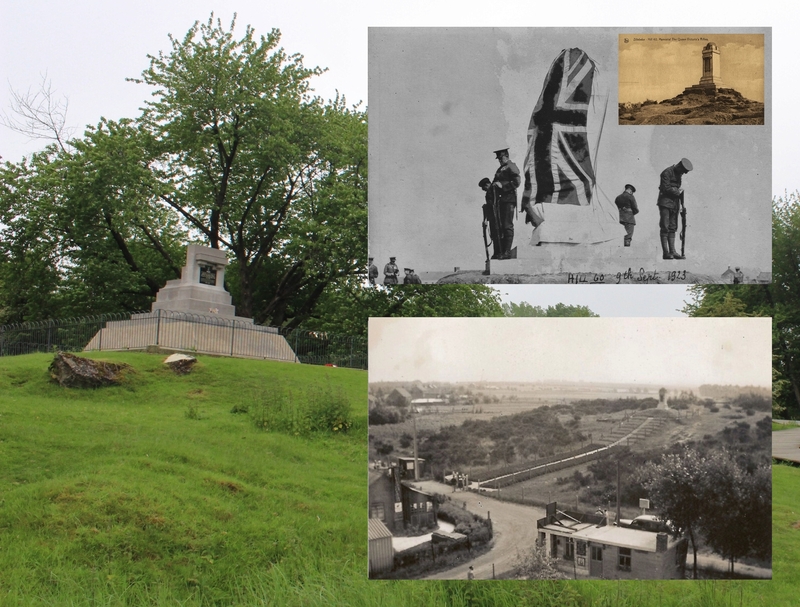 Repelling constant attacks throughout the night, when finally relieved the following morning, Woolley led just fourteen men off the hill out of a company of 150. 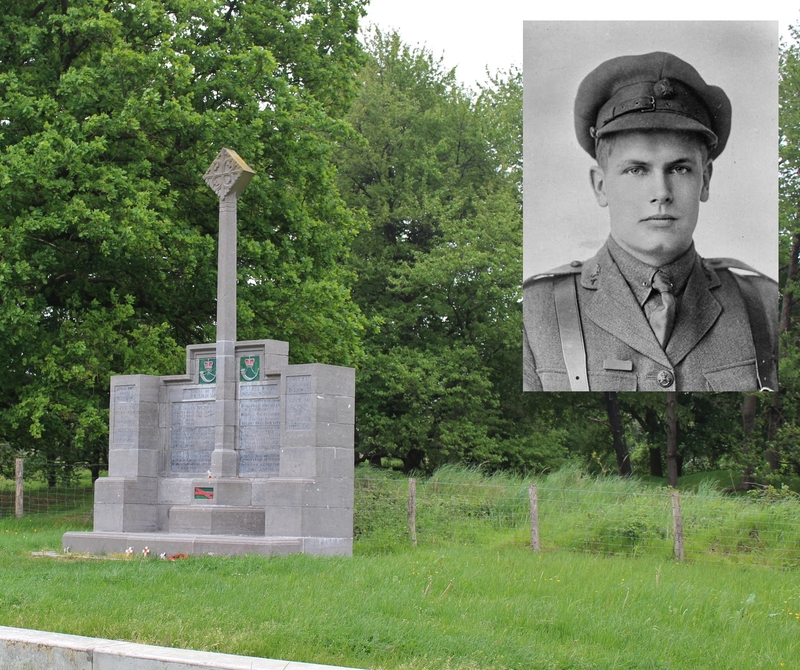 His citation reads, “For most conspicuous bravery on ‘Hill 60’ during the night of 20th–21st April, 1915. 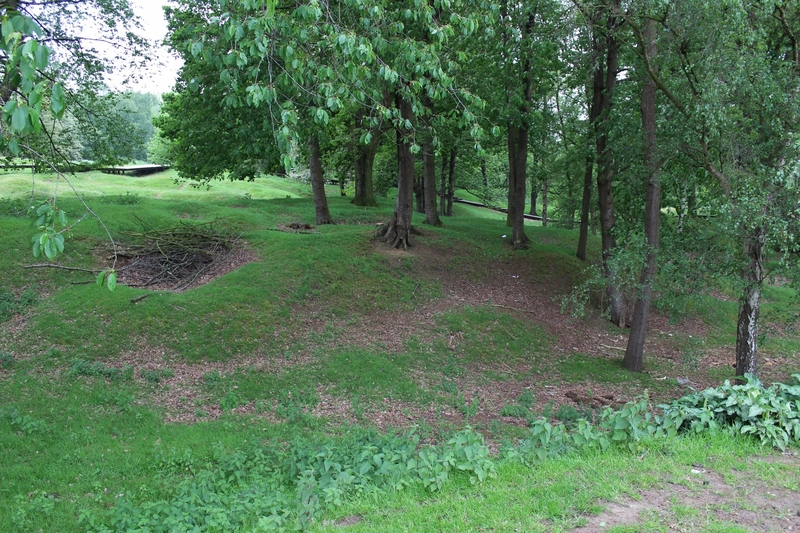 Although the only Officer on the hill at the time, and with very few men, he successfully resisted all attacks on his trench, and continued throwing bombs and encouraging his men till relieved. His trench during all this time was being heavily shelled and bombed and was subjected to heavy machine gun fire by the enemy”. 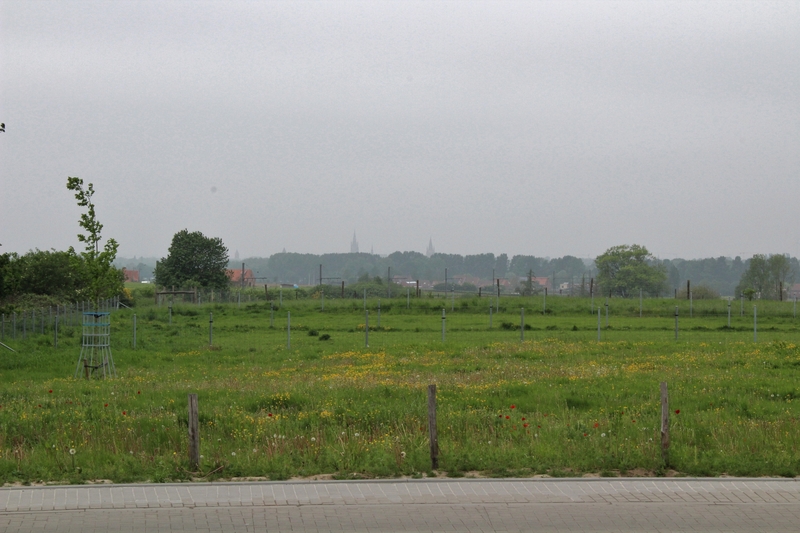 …I found myself once again gazing towards the spires of Ypres, just two and a half miles away, so near, and yet so far for the Germans. Apart from a few hours in 1914, the Germans would never enter the city. Well, not for another twenty six years, at any rate. Meanwhile, the survivors of the 1st Bn. 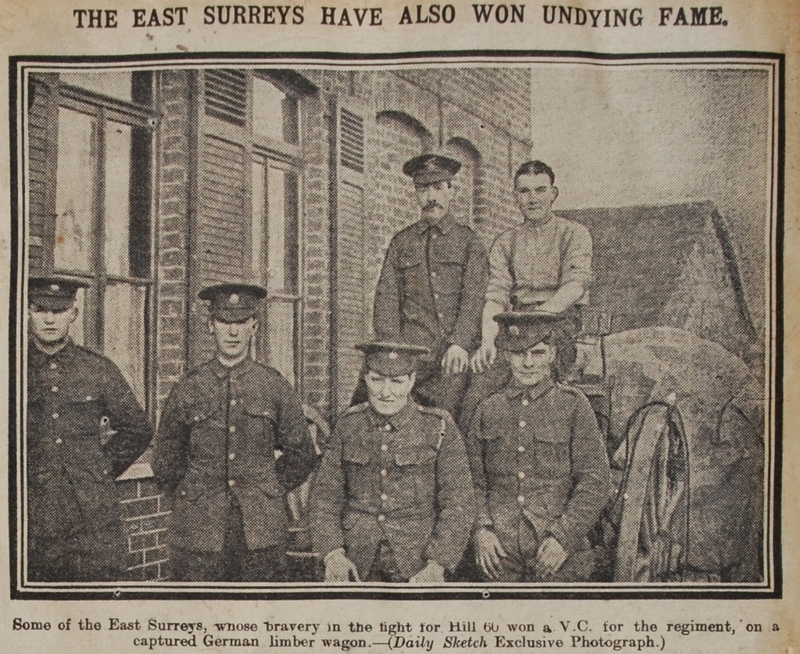 East Surrey Regiment posed for the national papers. 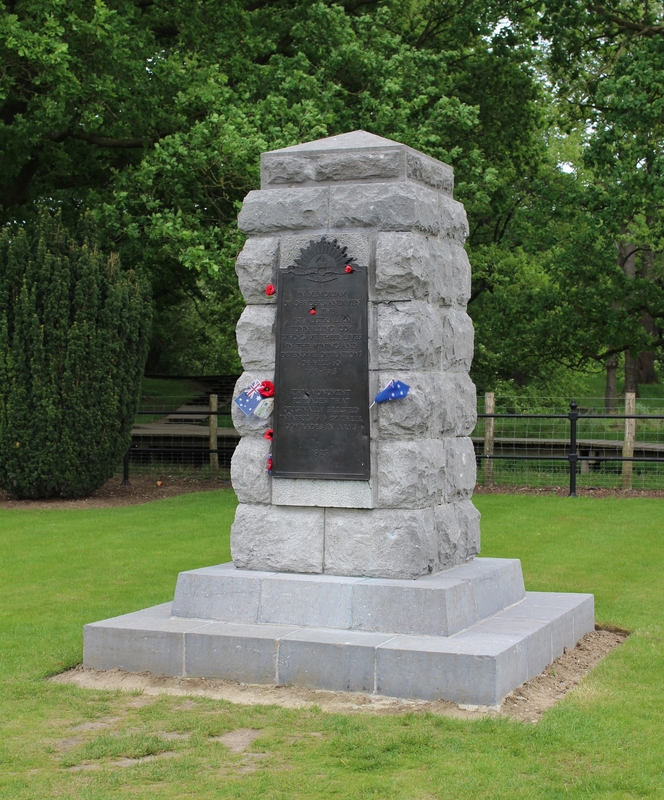 It would be a further ten days or so, 30th April, before the casualty figures for the Surrey’s 1st Bn. could be accumulated. *Gun shot wound, but you knew that. …George Roupell at the top of the page. 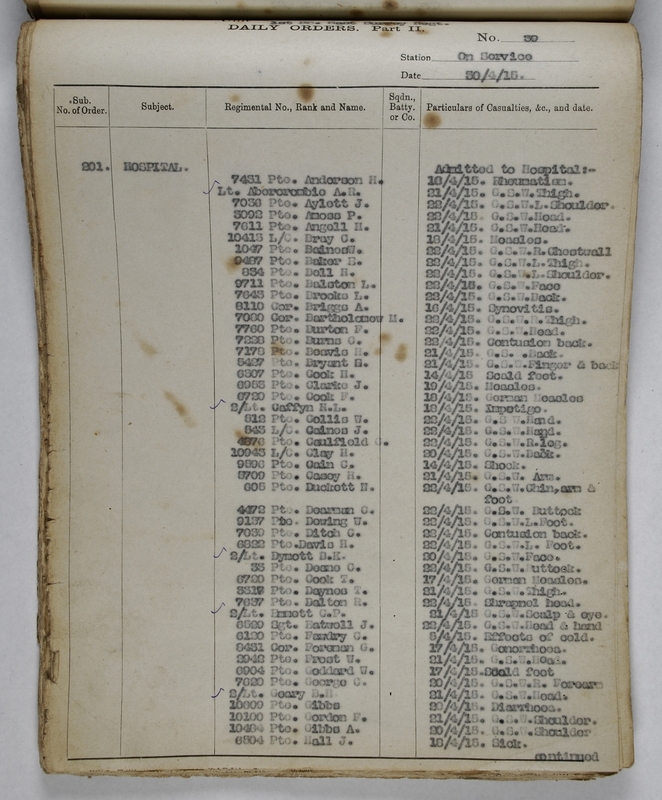 …but a few weeks later this form, dated 23rd May 1915, lists 35 men from the Hill 60 fighting a month earlier, all by this time confirmed as missing. 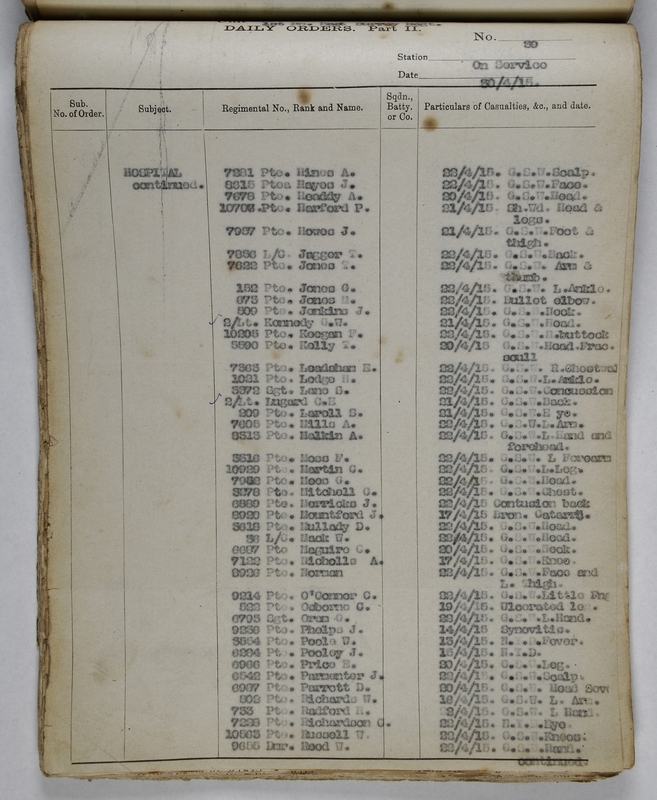 Three more men killed on 20th April are listed among the deaths at the top of the form. 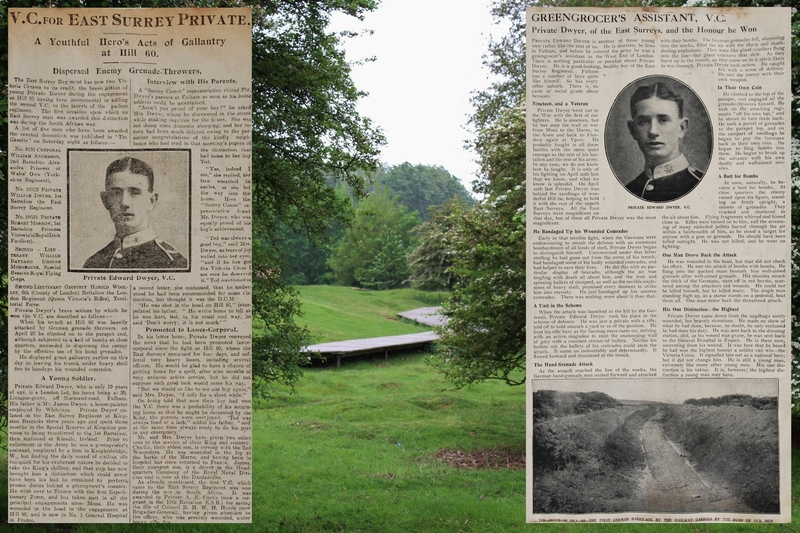 Although the wounds he received on Hill 60 were serious, once healed, if not recovered, Benjamin Geary was promoted to lieutenant and later acting captain with the R.F.C., with whom he worked on ground duties both at home and abroad. 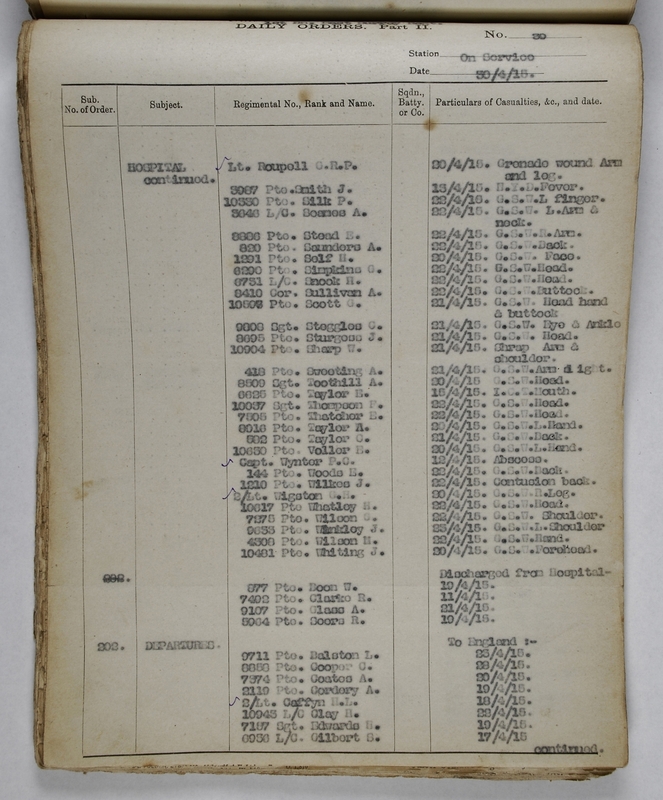 In January 1918, still an acting captain, he somehow inveigled his way back into the 1st Battalion East Surreys, now in Italy, where he commanded a company despite being medically unfit for duty; later in the year, in France, he would once more be wounded, retiring the following year as a captain. He later emigrated to Canada, served with the Canadian Army in World War II reaching the rank of major, and died on 26th May 1976 in Niagara-on-the-Lake, Ontario, Canada, aged 84. George Roupell would continue his army career until retiring with the honorary rank of brigadier in 1946. His Second World War exploits included spending two years posing as a French labourer in occupied France, his brigade headquarters having been overrun by the Germans during the fighting in May 1940, before eventually, with the help of the French Resistance, finding his way home via Spain and Gibraltar. He died in Surrey on 4th March 1974 aged 82. Incidentally, he is remembered in the Commonwealth Plot at Glasnevin Cemetery in Dublin, where we recently paid a visit. Geoffrey Woolley, promoted to captain within days of his exploits on the hill, would see further action during Second Ypres before being invalided back to England suffering from both the psychological and physical effects of gas, returning to the front in the summer of 1916 as a staff officer. After the war he would enter the church, and during the Second World War he served in North Africa, reaching the rank of major as Chaplain to the Forces 3rd Class, and appointed OBE for his services. His son, Rollo, a spitfire pilot, was killed over Tunis in December 1942. Geoffrey Woolley died in Sussex on 10th December 1968 aged 76. …he would eventually return to the front, falling in action on 4th September 1916 just outside Guillemont on the Somme. 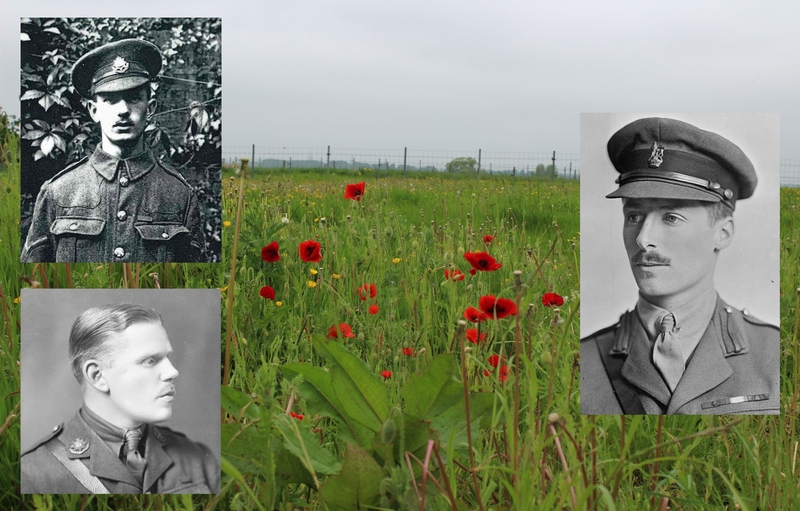 He is buried in Flat Iron Copse Cemetery, where we laid a wreath at his grave a couple of years back, and if you’d like to take a look, click here. 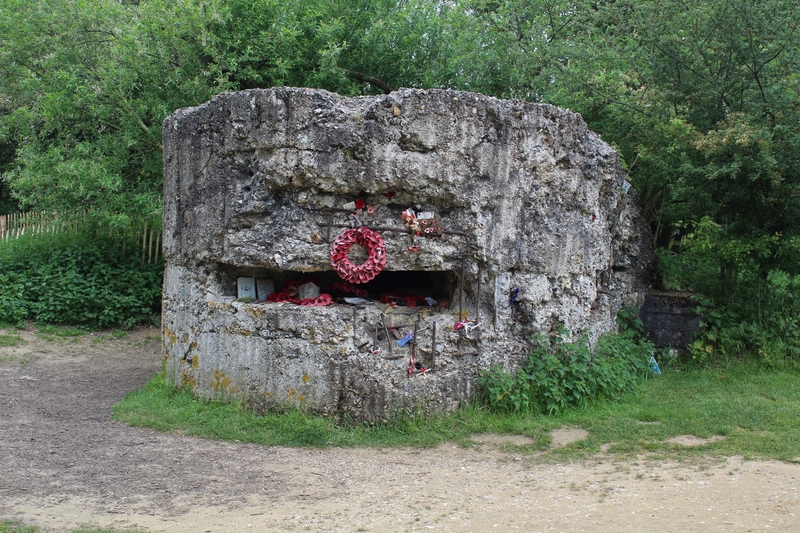 The fighting on Hill 60 would continue for the rest of April and into early May, as the British tenaciously held on to the craters in the face of continuous German assaults, including, on 1st May, the first failed gas attack of the war. At 8.45 on the morning of 5th May, however, the Germans released huge amounts of gas from the flanks of the hill which, rather than affecting a particular section of trench as it moved across it, proceeded to flow along the trenches instead, the rudimentary gas masks that the troops had already been supplied with mere days after gas was first used north east of Ypres proving incapable of protecting them against the suffocating fumes, necessitating the evacuation of the trenches and craters by any survivors who had not been overcome. The Germans following the clouds of gas not only took the crest of the hill but much of the British front line on the lower slopes of the hill to the west as well*, and although by evening they had been forced back to their captured positions up on the crest, a late evening British counterattack, and another on 7th May, failed to dislodge them, and there they would remain for the next two years. Until 7th June 1917, to be precise. *I refer you back to Trench No. 38, and the very first picture in this post. 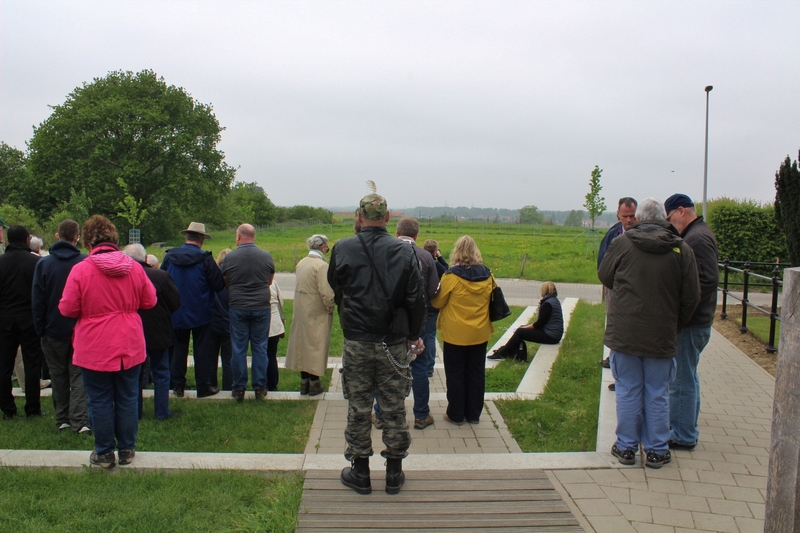 And if, after all that, you wish to see more, then click the link for a tour of Hill 60 in the Snow. 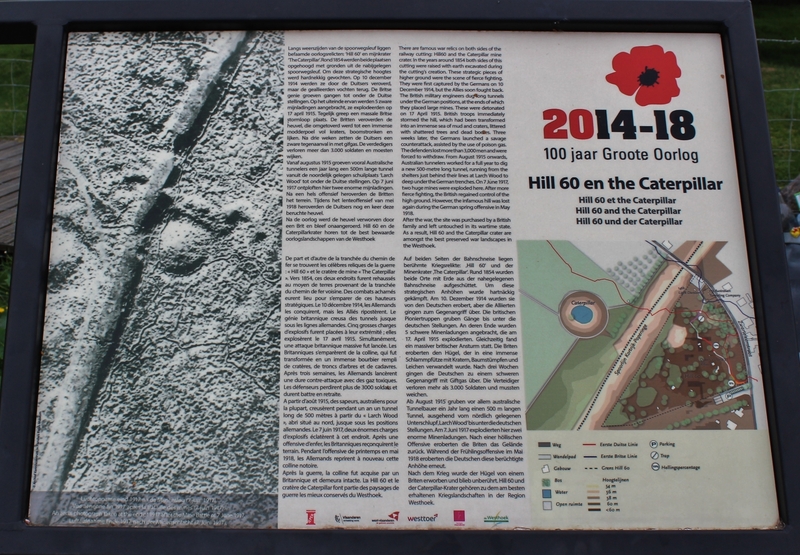 This entry was posted in Hill 60, Ypres (Ieper). Bookmark the permalink. Yet another excellent post MJS – I found the aerial photos with superimposed lines much easier to understand than the maps – look forward to more aerials in the future – can I see a drone on your Christmas wish-list? Thanks Sid. All seems right with the world when I get a thumbs up from your good self. Now, a drone, eh………….it had crossed my mind. 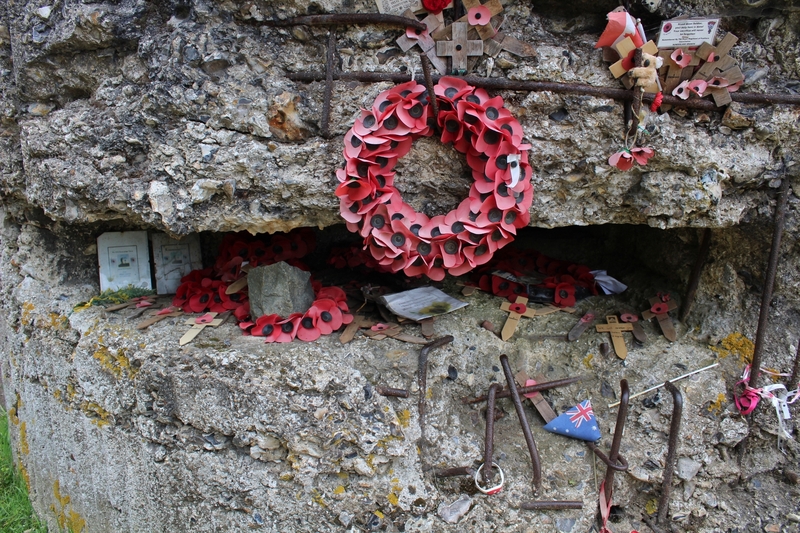 Great post M. Have visited the site but hadn’t realised the full history of hill 60. The no of VC’s won their. 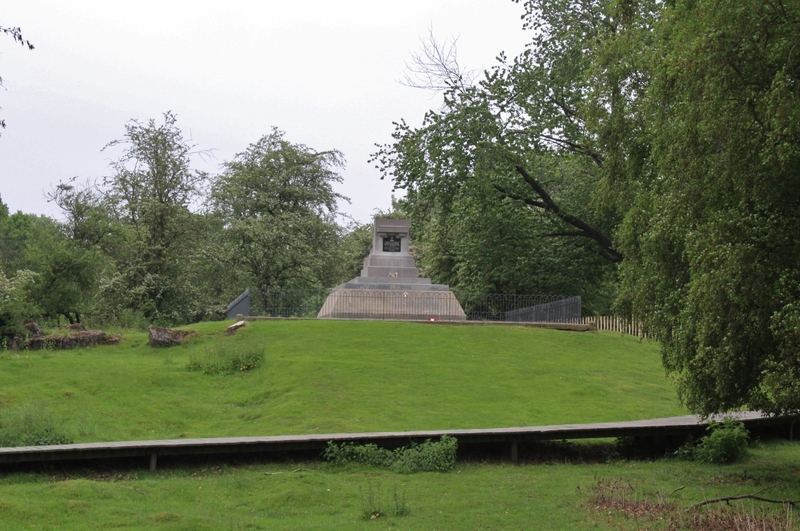 The thought of the hundreds of men of both sides remaining buried in that ground without a formalised grave is tragic. Thank heavens that family bought the land. Thanks muchly M. I don’t think you are alone in that. I wonder how many really understand the hill when they visit. 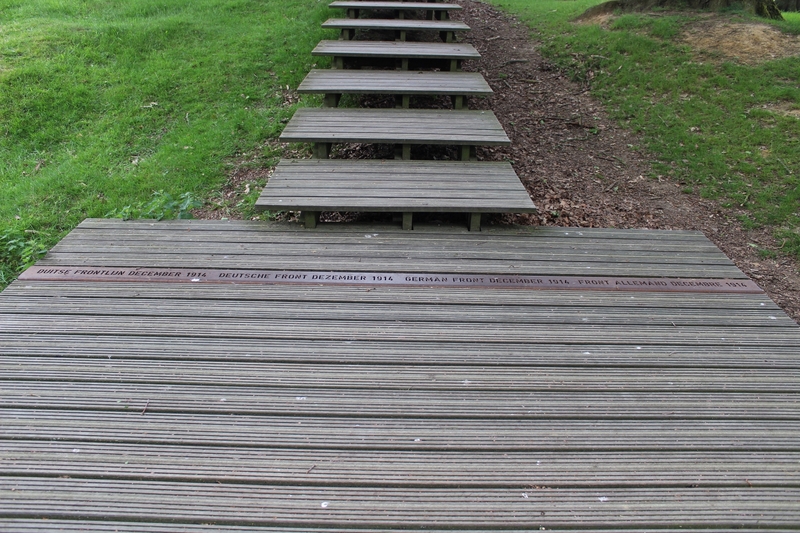 Hopefully my Hill 60 posts will help some visitors in the future. The Hill itself, the Caterpillar, the Dump and Larch Wood and the surrounding topography, all written about on this site, are all integral to understanding the Hill , and I have given an idea of the intensity of the fighting here, I hope – and let’s not forget the tunnellers, many of whom are among the men who still lie beneath the hill today, and whom I have hardly even mentioned in this post (plenty about them in the first Hill 60 post). Superb! 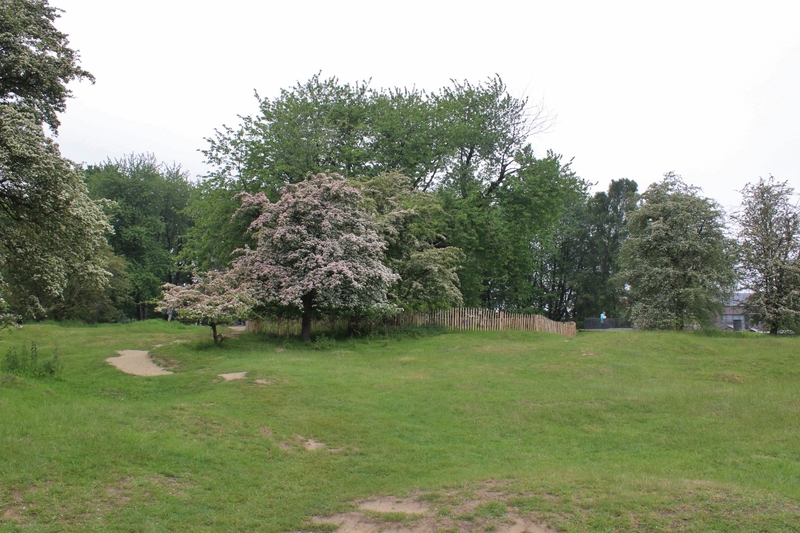 I visited the hill back in the spring, and was really surprised, given it’s reputation, at just how small it actually is. A true meat grinder of a battlefield. Thank you Sir. It is so small, and yet loomed so large in the minds of British soldiers during those first years of the war.